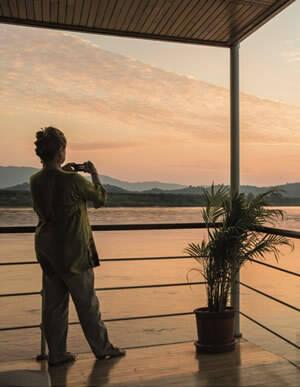 The Chindwin River flows down from the Burma – Assam border area, its waters rising from the Himalayan foothills. It is the main tributary of the Irrawaddy and is 1,207km long. Of this great length, about 1000km is navigable only in vessels that have the shallowest drafts in the world. These designs, perfected by the Irrawaddy Flotilla in the 1880s, are the ones that passengers of our Chindwin river cruises continue to use to this day. The Chindwin river flows through remote areas with few roads or cars and most communities are connected by the river. Above Homalin we are in Nagaland where until Christianity arrived in the 19th Century the Nagas specialised in shrinking the heads of their human quarry. This is the loveliest of rivers but treacherous to navigate and larger ships can only venture up there in the monsoon, and even then not without difficulty. Pandaw operates the ultra-shallow draft Zawgyi Pandaw throughout the dry season between Monyaw and Homalin and in the monsoon as far as Hkamti.